Stolní hra LOCK THE FLOCK/ MFP paper s.r.o. A flock of sheep enjoying the juicy grass of a mountain meadow have to get back inside their pen for the night. Get ready to count sheep which certainly won’t put you to sleep. There is no sheep dog to help you. Combine, add, multiply... Be faster than your opponents and watch out! There is one little sheep running to the woods. At the beginning of the game LOCK THE FLOCK the playing tiles and dealt out among the players (two players - 11 tiles each, three players - 9 tiles each, four players - 7 tiles each). For each player, the aim of the game is to assemble a locked enclosure in as short a time as possible. There must be at least one sheep and one water tank in a correctly locked enclosure. The final result is the number of sheep in the enclosure multiplied by the number of tanks in the enclosure. In the event that a player assembles, in accordance with the given rules, more than one enclosure the results are added together to make the final score. The locked enclosures may or may not be connected. While assembling enclosures there must be no dead-end part of a fence inside an enclosure. The rules permit one or more empty fields inside an enclosure where no tile is placed. When the fastest player announces that he has finished the others must immediately lock their enclosures to end the game. 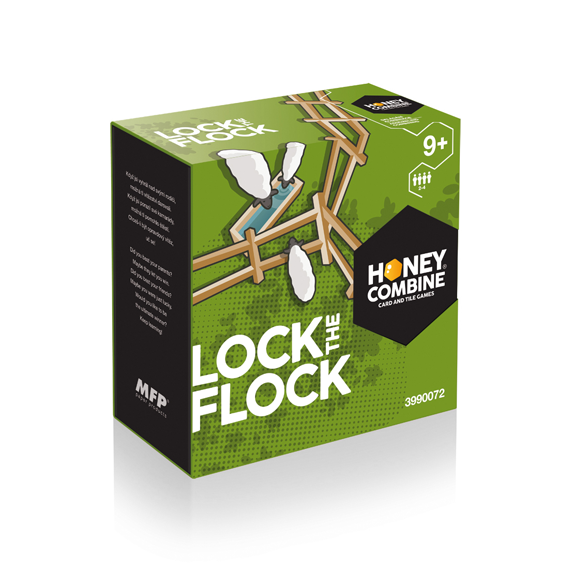 The winner of the game LOCK THE FLOCK is the player with the highest score.